You'll find them on jetties - not mudflats! On the north Atlantic coast, a slate-gray sandpiper picks among the barnacles and mussels that encrust a jetty’s massive boulders. At the same moment, a parallel scene unfolds on the north Pacific Coast. A slate-colored sandpiper emerges from the salt spray to forage over a windswept jetty. 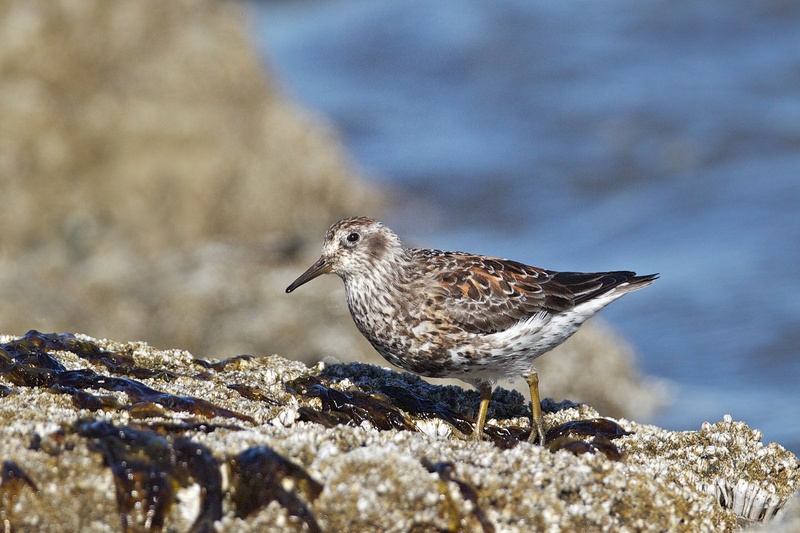 These look-alikes are the Purple Sandpiper of the Atlantic (pictured here) and the Rock Sandpiper of the Pacific. They embrace a seemingly perilous life amid storm-tossed boulders instead of probing sheltered mudflats like so many of their kin. Support for BirdNote comes from Forterra, saving keystone places for people and nature in the Pacific Northwest. On the north Atlantic coast, a winter storm sends waves crashing over a rocky jetty. [Breaking waves] As the waves retreat, exposing the rocks once more, a slate-gray sandpiper clambers up. Using its long bill, it picks among the barnacles and mussels that encrust the jetty’s massive boulders. At the same moment, a parallel scene unfolds on the north Pacific Coast. [Breaking waves] A slate-colored sandpiper emerges from the salt spray to forage over a windswept jetty. Short-legged and portly as sandpipers go, the two often feed alongside slightly larger turnstones – [Ruddy Turnstone] - specialized shorebirds that share their daredevil habits. Bird sounds provided by The Macaulay Library of Natural Sounds at the Cornell Lab of Ornithology, Ithaca, New York. Song of the Purple Sandpiper  recorded by G. Vyn; song of Rock Sandpiper  recorded by L. Decicco. Call of Ruddy Turnstone  by M.J. Anderson. Wind Nature SFX Essentials 01 recorded by Gordon Hempton of QuietPlanet.com. Winter waves on rocky shore recorded by C. Peterson at Lopez Island. 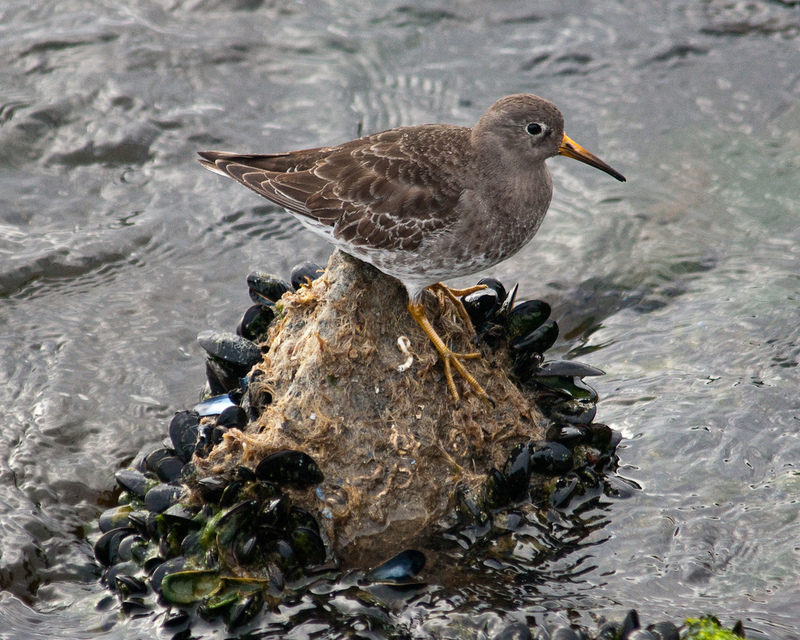 Here's more about the Purple Sandpiper!